Inspired by ships: Syed Farouk briefing the media on the Maritime Residences. Driving into Putrajaya is like entering a magical kingdom consisting of buildings with various architectural styles, including from India, the Middle East and Europe. One of the early buildings is the Perbadanan Putrajaya complex, a landmark in Persiaran Perdana, Precinct 3.
viewing deck on the top level where one can take in the city skyline including the Palace of Justice and the Grand Mosque. The gateway also providing a vantage point during parades. The 10-year-old administrative capital has some designs that are marine-inspired with structures resembling ships. Over the years Putrajaya has been a popular spot for wedding photography as it is a melting pot of natural and man-made beauty. 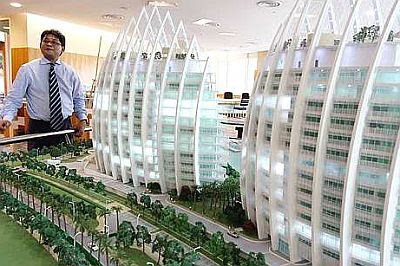 The development of Putrajaya is carefully planned to maximise the beauty of the various architectural styles and the city also attracts movie-makers. Among the top 10 structures are the Putra Bridge, Seri Saujana Bridge, Putrajaya Lake, PICC, Putrajaya Botanical Garden, Putra Mosque, Millennium Monument, Putrajaya Corporation Complex, Seri Gemilang Bridge and the Putrajaya Landmark. Putrajaya Holdings Property (PjH) services division head Syed Farouk Azlan Syed Abdul Aziz said the development plans and the international hub in Precinct 8 which are part of the Putrajaya Master Plan 2011-2016, would attract foreign investments and the expatriate community. He said the Central Business District on the core island where more futuristic buildings were planned, include office towers, business suites, retail complexes, hotels, institutions of higher learning, recreation and entertainment centres. “All PjH projects carry the master developer’s signature and developed in line with the Government’s aim to develop Putrajaya as a model green city,” he said during a briefing on the futuristic buildings under construction. He added that some of the buildings which started construction in 2007 were completed last year and designed with green open spaces. Syed Farouk said one building that would have visitors talking about in the future is the Maritime Residences, a main residential complex conceived like a fleet of boats floating in the lagoon. The Waterfront Complex once completed would blend well with the Seri Wawasan Bridge, a cable-stayed bridge. “This is the iconic building of Putrajaya. One need not go to Dubai to see modern and futuristic buildings. They are all here in Putrajaya,” said Syed Farouk. He added that a modern waterfront commercial centre — Promenade @ 8, facing the Alaf Baru monument, which is now under construction would be the business and commercial hub of Putrajaya. Syed Farouk said the landscape of Putrajaya was changing fast and hopefully some of the new building designs would steer the city forward. The residential population of Putrajaya stands at 80,000 and the working population at 120,000. PjH hopes for a four-fold increase in the residential population in the near future. Is the 5/95 housing loan scheme a better option?